Three Top 25 spots were claimed by a trio of teams from Ohio as Week 5 of the high school football season produce mostly expected results and few changes to the top of the national rankings. La Salle (Cincinnati, OH), Colerain (Cincinnati, OH), and St. Edward (Lakewood, OH) moved in to Nos. 23, 24, and 25, respectively. The Explorers remain the favorite for the Division II title and with an overtime win over Colerain it is still on the top spot in the state. Colerain is holding off St. Edward — which has been among the most surprising teams in the country this year — as the Eagles moved into the Top 25 this week after beating Bergen Catholic (Oradel, NJ). Bishop Amat (La Puente, CA) comes into the Top 25 at No. 21 after three consecutive weeks at No. 26 and St. Joseph Regional (Montvale, NJ) rode its strength of schedule into the No. 22 position — just ahead of the Ohio trimumverate. The teams that are falling from the Top 25 to make room was a simple turnover of the previous Nos. 21-25 teams. Bergen Catholic — which has lost consecutive games to IG Academy (Braendton, FL) and St. Edward — to fall to No. 27. Previous-No. 22 Archer (Lawrenceville, GA) had a solid win this week against Parkview but was jumped by the aforementioned teams with a much more impressive resume of wins. No. 23 Steele (Cibolo, TX) had soft footing last week after a narrow escape against DeSoto (TX) and fell this week despite a win versus Smithson Valley. No. 24 Rummel (Metairie, LA) only dropped to No. 29 after falling to Don Bosco (Ramsey, NJ) on the road, 10-3 — a result which jumped Don Bosco from No. 40 to No. 26. Lastly, South Panola (Batesville, MS) has been dragged back towards the crowd as the play in Mississippi has been grading out much lower than the expectations in the preseason and the Tigers haven’t exactly been impressing in its victories this year. Aside from the turnover within the Top 25 there was plenty of movement behind the first quarter of teams. Five others turned over after play was compltelete this week. Bolles (Jacksonville, FL); Brother Martin (New Orleans, LA), and John Curtis (River Ridge, LA) make initial appearances in the poll for 2015 while Converse Judson (TX) and Starkville (MS) return after each fell out after the first week of the season. Previously-ranked No. 56 Good Counsel (Olney, MD); No. 76 Osceola (Kissimmee, FL); No. 82 Zachary (LA); No. 91 Madison Central (MS), and No. 98 St. Mary (Orchard Lake, MI) all fell from the HSFB100 after losing. Check out the complete HSFB100. The Braves went to New Jersey and dominated St. Peter’s Prep — as expected — 56-14. The offensive line was too much as St. John Bosco had Sean McGrew go over 200 yards rushing and Quentin Davis pass for a ton of yards. The game was as close as 21-14 for all of four plays before St. John Bosco ran and hid. Similar to St. John Bosco, the final score was as expected but it took the Gaels a little while to get in gear against Servite. It was a 10-7 game at halftime before the team scored fast and furious in the third quarter to extend the lead and push the game to a 38-7 final. 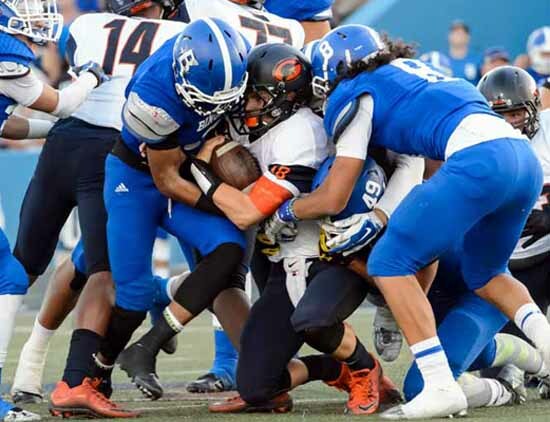 Most all of the Top 10 was unimpressive this week and Bishop Gorman benefitted from that as it did not get jumped. Against what was its easiest foe of the football season, the Stags didn’t have a problem getting out of the gate as it rolled over St. Mary Ryken, 49-0. The wins over Miami Central, American Heritage, and La Salle continue to stand up as each of those three continue to win. It’s game with St. John’s was made more intersting as it defeated Good Counsel this week — knocking the Falcons from the HSFB100. Colquitt was idle this week in advance of Region 1-6A play opening in October. It moved up as St. Thomas Aquinas fell. Centennial was idle this week and should roll through the rest of its regular season schedule. Its final placement will be determined by the Pac5 playoffs and potential CIF Bowl Game. St. Thomas Aquinas was tested this week and struggled to get a passing grade against now-No. 46 Hallandale. The Raiders trailed from the whistle until inside of four minutes left in the game before Trevon Grimes bailed out the team with an amazing catch over two defenders to give the team the lead. It extended it in the last minute for a 36-28 decision. The Patriots marched out to an early lead against Norland with a 27-0 lead at halftime. It salted the game away with a final margin of 36-21 as it allowed two touchdowns in the closing minutes — when it didn’t matter. Heritage rushed for nearly 250 yards against a Vikings defense that had been playing well on the season. IMG Academy was idle this week but slid up in advance of its game with No. 22 St. Joseph Regional. The Ascenders offense will be tested this coming weekend by perhaps the best defenses in New Jersey. Allen was in a battle with Marcus this week as starting quarterback Seth Green turning the ball over too many times and putting the Eagles behind the eight-ball. Mitchell Jonke came off the bench in the second quarter and helped guide the team to a 38-28 victory — and probably put himself in line to see more playing time ahead of the four-star Green. The defense is still very good and if Jonke — or Green — can manage the football it is a threat to four-peat. The Vikings were not challenged by Riverside and the supremely talented team cruised to a 55-7 victory. Like other moves this week, Spartanburg made a jump over several teams that underperformed against the expections set for HSFB100 ranked teams against teams that it should dominate. Spartanburg checked a box, but it was better than others. For the second week in a row the Trojans pulled away in the second half, this time bettering Colleyville Heritage, 59-33. The offense is working as planned with Tyler Natee and Ja’Ron Wilson grinding out big yards on the ground. Trinity still has Southlake Carroll coming up before the state playoffs so there are more chances to measure this team. De La Salle was idle this week and made a minor slide up as the temperature taken of Cedar Hill had cooled some. It is a shift that is immaterial in the grand scheme as both have multiple tests ahead of it. Cedar Hill was idle this week and its slide backwards was probably week too late as it should have fallen towards this range after its game with Coppell the week prior. There is still multiple games for Cedar Hill to test itself and the rankings will take care of itself. The Monarchs continue to impress on both sides of the ball. This week freshman quarterback JT Daniels nearly topped 300 yards passing, coming in at 293 and three touchdowns. Running back Brandon LaMarche gained 146 on the ground as the team pushed towards 500 yards of offense in a 42-26 win against Edison. Trinity League opens after a bye this coming week and the expectations for Mater Dei continue to rise. Mainland had a solid showing against a quality Dr. Phillips team, winning 28-7. While most expected more offensive production from both sides it was the defense that came to play. Mainland limited Dr. Phillips to just 119 yard and forced three turnovers. The performance was somehow made more impressive as it was done in spite of being flagged for 14 penalties. The Bucs will travel to Ohio and take on current No. 25 St. Edward in a few weeks to see where each program belongs before an interesting playoff path in Class 6A. Grayson checked the box against Berkmar in a 49-10 beating. The Rams are well positioned for the playoffs and the opening of the playbook to be more balanced has made the program much more respectable as a title threat. The defense is strong as usual and now there it a threat to score more than 20 points. Male has beat the last two teams it has faced 120-0. The needle isn’t moved much as Seneca last week and Butler this week are not formidable foes. Another check the box game is coming against Pleasure Ridge Park. The playoff rematch against Louisville Trinity may be the next relevant game as Male is becoming a buoy. Katy allowed only its 10th point against it this week as Katy Taylor put a field goal on the board in a 41-3 contest. Katy, like Male, is a buoy until playoffs start. Teams with more impressive wins will continue to jump the Tigers and it will slide up if others fall ahead of it. Chandler should be back to full strength next week against Basha. It made it through its stretch of locked in victories with another blowout, knocking out Mountain View, 47-14. The next month for the Wolves could push it back towards the Top 15 — or show it the door, with Basha, Brophy, and Hamilton to close the year. STOCK DOWN: It was time to lump Ocean Lakes into the group of buoys as the talented team hasn’t played a meaningful minute of football this season. It beat Green Run 61-6 this week. Its next three foes are a combined 3-12 so expect more lopsided scores as the Dolphins will have tougher practices than games. Bishop Amat had been at No. 26 for the last three weeks and with the slide of the five teams previously ranked ahead of it, the team moved up. It dominated Sherman Oaks Notre Dame this week, 56-7, and the Lancers appear to be the best team in the Mission League. It will have to beat No. 60 Alemany and No. 74 Serra to confirm that assumption in the next month. STOCK UP: Strength of schedule and defense push the top team in New Jersey to the Top 25. It has a 17-7 win over now-No 26 Don Bosco and a 22-20 victory over now-No. 25 St. Edward. Wins over DePaul and Eastern Christian each weigh less each week but they round out four quality victories to open the year. The Green Knights have the best defense in New Jersey but it may not have the offense to win a state title, which will put a wrench in the rankings, too. The top team in Ohio — by a slim margin — takes a spot inside the Top 25 this week. La Salle beat Northwest, 56-19, this week and will open GCL play this week with Moeller up first. It has a win over No. 24 Colerain and will have to take on No. 31 St. Xavier and No. 86 in the coming weeks. If it doesn’t win a state title it would be a major upset. Colerain also gets a slight bump up but not largely based on what it did this week as it beat a Middletown team that has only been a small thorn in its side with one win in as long as anyone can remember. The Cardinals are wedged between La Salle — which it lost to in overtime — and St. Xavier — which it beat in overtime. The balance in Cincinnati is great and the teams are all very good and talented. STOCK UP St. Edward made enough plays to win one of the best games of Week 5 against now-No. 27 Bergen Catholic, 31-28. It has a win over No. 33 Gilman by a single point, a two-point setback against No. 22 St. Jospeph Regional, and the win over Bergen. It will host nationally-relevant Cocoa this week, then No. 15 Mainland the week after. It also has Moeller and St. Ignatius to close the season before the playoffs. Defeated now-No. 29 Rummel, 10-3. Lost to now-No. 25 St. Edward, 31-28. Lost to now-No. 26 Don Bosco, 10-3. STOCK DOWN: Central turned what should have been an easy win against Booker T. Washington into a close contest, pulling out a 35-28 victory. The Rockets have a less impressive win against Norland than what American Heritage just did this week and it struggled against BTW in ways that St. Thomas Aquinas didn’t. Miami Central is sliding backwards. STOCK UP: Collins put together what may have been the most impressive result of the week as it crushed rivals Klein Oak to the tune of 53-7. After allowing the opening kick to be returned for a touchdown there was nothing that didn’t go the way of this team. Lost to now-No. 6 St. Thomas Aquinas, 36-28. Defeated Putnam City North, 63-7. STOCK DOWN The benefit of the doubt is running out for Lake Taylor. For the second week in a row it was not impressive in a victory. This week it needed a pick-six to take the lead and close out a game after a big play sealed a contest the week before. There may not be much skin left on the teeth of the Titans for HSFB100 placement. STOCK UP: This is a devisive team in the HSFB100 as there is not a consensus that it even belongs as the top team in Class 5A let alone in the rankings. It has played impressively the last two weeks and gets a generous spot in the poll — which will be measured this week against Mansfield Timberview. Defeated now-No. 95 John Curtis, 40-37 in overtime. Lost to now-94 Brother Martin, 40-37 in overtime.